Lake Sunapee is one of the largest New Hampshire lakes. The lake is enjoyed by residents and visitors due to its unspoiled beauty. With more than 4,000 acres of crystal clear waters, and 25 miles of shoreline that includes seven sandy beaches and six boat ramps Lake Sunapee is a true natural retreat with Sunapee Ski Area within minutes of the lake. Fishing is obviously a major pastime in the whole New Hampshire lake region with Sunapee being one of the most popular destinations for fishermen from all around the world. Regular competitions, including children's fishing contests that are used to control the population of the predatory Red Eye Bass that was introduced by mistake, are held annually. As well as the fish found within the lake, Sunapee is also renowned for the Loons that visit annually. The surrounding mountains and the Sunapee watershed enjoy some of the most varied and unusual wildlife from turkeys, deer to moose. 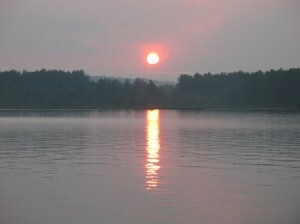 Sunapee and surrounding lakes are so popular thanks in part to this unspoiled and well kept natural beauty. With the lake and mountains a Lake Sunapee home offers almost immediate access to mountain skiing, boating, hiking trails, cycling trails, annual art exhibits and much more. For families and individuals looking for a natural, clean, and friendly community life, Lake Sunapee real estate has everything. Lake Sunapee is New Hampshire's fifth largest lake at 4136 acres and it has eight islands (Great Island, Burkehaven Island, Star Island, Little Island, Loon Lighthouse Island, Emerald Island). The lake is a glacial lake and the water quality is exceptionally. Lake Sunapee is surrounded by the towns of Sunapee, Newbury, New London and George's Mills. Additional Lakes in the Sunapee area Otter Pond, Little Sunapee, Ledge Pond, Baptist Pond, Perkins Pond, Mountainview Lake, and Chalk Pond. www.lakeorskirealestate.com of more on these lakes. Fish in the lake include Lake Trout and Landlocked Salmon both requiring deep pure cold water. Warm water fish in Lake Sunapee are Small Mouth Bass, Chain Pickerel, Yellow Perch, and Brown Bullhead Catfish. Watch out for the Loon's while you are casting for a trophy salmon. Beaches - Lake Sunapee has seven sandy beaches; Sunapee Harbor, Dewey Beach, Georges Mills, Newbury Harbor, Soo-Nipi, Granliden, and the Sunapee State Beach. Sunapee State Park is open 9:30 am to 7:30 pm, a fee is required. Skiing - Mountain Sunapee has ten lifts, including three quad chairs (one high-speed), two triple chairs, one double chair, and four surface lifts. Sunapee has 65 trails and slopes covering 230 skiable acres; 17 novice trails, 32 intermediate trails, and 16 expert trails. Ragged Mountain and the Dartmouth Skiway are just a short drive.